There are some movies that satisfy you and fill you up, whereas others you cannot help but to keep chewing and mulling over in your mind. Some films, irrespective of quality and mastery, are indeed like junk food. They give you satisfaction in the moment, but then down the stretch of time, they lose their flavor. Others, however, are not for temporary or instant consumption and full-filment, but are food for thought and may become classics or cult films years down the road. In my view, Birdman and Boyhood fall in the former, Foxcatcher in the latter category. Bennett Miller's movie left me in a state of unease. I was impressed, but at the same time I cannot shake it off. It has that je-ne-sais-quoi characteristic that makes it stand out from the myriad other movies I have seen. While I was immediately driven to write my impressions and a review of Whiplash, this one I was ruminating about and it has been lingering in my mind for weeks now. Moreover, I was sharply inclined not to write anything on it. But I cannot resist. The title is “catchy” enough; this man du Pont is intent on catching foxes (whatever that means) and is not interested in saving children from steep cliffs. The title is not merely an artistic pose, but makes sense in the context of the incidents. For one, du Pont's family was obsessed with hunting, whereas he was not interested at all in traditional hunting; second, and more importantly, “Foxcatcher” was the name of the wrestling training camp that this millionaire created on his own private grounds. This is a film about wrestling, in the same way, Miller's previous film Moneyball was about baseball. The answer is it is not so much about the sport itself; references to it are incidental. What Foxcatcher is really about is ... well let us pause for a moment and not rush things and try not to box fixed structures on a fluid and mesmerizing film just yet. The film is about an odd - but in their own idiosyncratic and absurd way fascinating - trio: Two brothers who are successful wrestlers, and a creepy rich man who claims to love wrestling and wants to sponsor and train them to further Olympic success. From the onset, we sense that the Schultz brothers have a tight relationship. They care for each other, and they love the sport, but they seem incapable of expressing their feelings. There are also fundamental differences in their situations: one of them, David, has a family; the other, Mark is lonely and lacks close relationships. We see him live a desolate and lonely life, and the call from du Pont may seem like a rescue from his dire situation. Du Pont's supposed motive is his patriotism. He thinks that America has let down or back-tracked regarding promises to the sport of wrestling, and he wants to, single handedly, put wrestling back on the map. He will provide all the necessary expenses to prepare Mark Schultz for further greatness, for his next Olympic medal. All this talk and the opulent grounds and wealth of his strange benefactor make a very strong impression on young Mark Schultz's impressionable mind. Mark soaks up du Pont's words and ecstatically transmits them to his brother David, who is more level-headed and rational and has his doubts vis-à-vis the millionaire's real intentions. First off, it is inevitable, which a number of critics have pointed out, to see this film as an examination and criticism of the American dream and patriotism. Wrestling is not an American sport per se, but it serves as an interesting metaphor of trying to pin down the competition and to come out on top. Attributes of resilience and the die-hard and never-give-up attitude prevail during the training sessions. These wrestlers underfunded and overlooked by their government are given a chance to shine and win over fans among the American populace by proving those narrow-minded officials wrong, at least so the story goes according to du Pont who is willing to put his own money, a mere slice of his grand fortune, into this endeavor. The movie can be read as a criticism of misplaced patriotism and the American dream. Just look at du Pont, the spokesperson and advocate for these ideas. He has his own chopper and does cocaine on top of it just before an important speech. To make matters worse, he offers his protege wrestler Mark pinches of this white powder. There is, however, much more to this person. In real life, he was in fact much worse, and Bennett Miller decided to dial it down for his movie (Take a note Michael Bay!). We see du Pont buy major weapons and tanks from the US military and simply by being rich, he has a number of important government contacts. But his behavior is bizarre, and his real motivations remain hidden. By presenting us such a flawed character expressing such lofty ideas, one can assume that the Australian director is subtly putting up a mirror to re-examine these ideas in a clearer light. What's in it for du Pont? Is it patriotism that is his driving force? It may seem so during his speeches, but there is something profoundly mysterious and creepy about this man. It seems to be more than mere service to the country; there is an underlying desire or hidden motivation behind his decision to fund wrestling. His mother, the only family he has, is dead set against this sport, which she considers uncivilized and vulgar. Du Pont tries hard to impress her to no avail. She is still in charge, especially when it comes to managing their fortune, and du Pont follows her like a puppy, maybe rebelling slightly here and there and once in a while, but he lacks the guts and courage to break off in his own direction. Furthermore, there seem to be an unspoken homosexual attraction towards these muscular and greasy men he surrounds himself with. Could he derive a secret unacknowledged sexual attraction towards these wrestlers? The movie slightly hints in that direction without however committing itself to such an interpretation. Everything takes a turn for the worse, once du Pont's mother dies, and he is given free reign to do as he pleases with his immense fortune and power. In fact, he completely loses it and commits a horrible deed, which I will not give away here. Yet throughout the film and regardless of our unease regarding this bizarre man (and what a great nose plus brilliant acting performance by Steve Carell), we cannot help but feel empathy for him. We feel sorry how this man who is ironically buried under mounds of wealth does not achieve happiness. In fact, most of his life, he has lived in the shadow of his domineering mother and then, for whatever reason, he has never found any satisfaction in life despite (or because?) having anything he wants at the flick of a finger. In the film, we see that he literally suffers to see David happy with his family, his wife and children. There is also a flicker of resentment on his face how there are other more important things than wrestling, fame, or money. And as they say, there are some things that money cannot buy, and this may explain to some degree why du Pont acts the way he does. 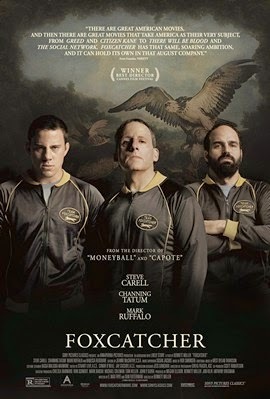 Yet the movie, with this particular characterization especially, chills me to the bones, and the “Foxcatcher” himself like an embodiment of a half-forgotten horror film did show up in one of my nightmares and is still making me shudder, while at the same time I cannot stop raving about this brilliant film.